You may never see indie rockers Tegan and Sara, Second City's Andrew Alexander and Bach pianist Angela Hewitt under the same roof again. On June 1, these artists, among other laureates, are being honoured with the highest distinction a performing artist can achieve in Canada — a Governor General's Performing Arts Award. The Governor General's Performing Arts Awards (GGPAA) were created in 1992 by the late Right Honourable Ramon John Hnatyshyn and his wife Gerda to celebrate achievements and contributions to Canada's cultural enrichment. Nominated by the general public, laureates are distinguished in the categories of theatre, dance, classical music, popular music, film and broadcasting. The awards themselves will be presented to the laureates at a ceremony in Rideau Hall on June 1, and on June 2, the laureates will be feted at a black tie gala at the National Arts Centre hosted by CBC News's Heather Hiscox. Below are 2018's laureates for Lifetime Artistic Achievement Awards and the National Arts Centre Award. ​Last year, Calgary's queer indie rock duo Tegan & Sara released The Con: X to mark the 10th anniversary of their widely acclaimed 2007 album The Con. 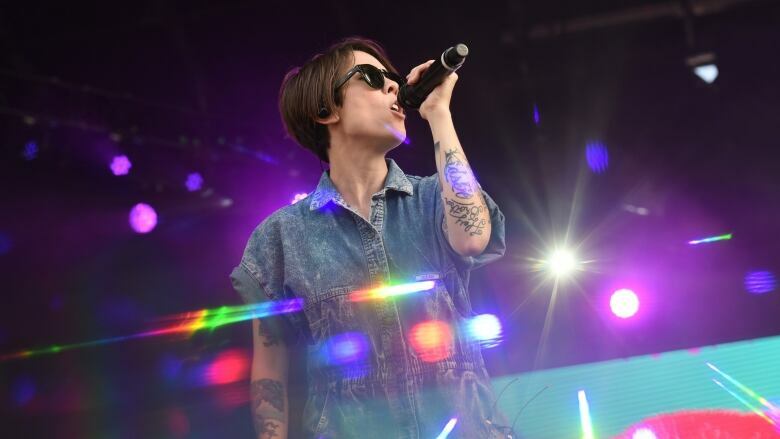 Proceeds from their 2017 album were donated to The Tegan and Sara Foundation, which advocates for women and non-binary people in LGBTQ+ communities. "I thought about when we were teenagers, how we didn't have a ton of people to look up to," says Tegan Quin in the video above, "there was no one that really spoke for us." In 1974, producer Andrew Alexander brought Second City to Toronto at a time when improv comedy was relatively new to the nation. When he launched the pioneering sketch comedy show SCTV in 1976, the unique Second City brand of improv caught on like wildfire across North America. Alexander went on to produce film and television projects with stars like Tina Fey, Stephen Colbert, Bill Murray and Mike Myers, to name just a few. Ginette Laurin is known across the world as Canada's most influential choreographer and Quebec's pioneer of contemporary dance. She founded Montreal's O Vertigo Danse company in 1984 and went on to create her signature works La Chambre Blanche (1992), Luna (2001), Passare (or Another Shape for Infinity) (2004) and more recently Soif (2014). Before receiving the Lifetime Artistic Achievement Award for Dance, Laurin became a Member of the Order of Canada in 2015. After training at Montreal's Conservatory of Dramatic Art, Geneviève Bujold's began her acting career in 1962 when she played Rosine in a stage production of The Barber of Seville. She went on to appear in more than 70 films in French and English, in a career that's spanned more than 5 decades. Bujold was awarded a Golden Globe Award for Best Actress in a Leading Role and an Academy Award nomination for her most famous role as Anne Boleyn in Anne of the Thousand Days (1969). Scotland-born, Canada-raised Murray McLauchlan has been creating and performing internationally acclaimed folk music for over fifty years. Along with being inducted into the Canadian Country Music Hall of fame, he holds 11 Juno awards, including several for his 1972 hit single Farmer's Song. From 1989 to 1994, McLauchlan hosted the popular CBC radio program Swinging on a Star, which showcased singers and songwriters across Canada. And his commercial pilot license helped launch the 1985 CBC television special Floating Over Canada. Not since Glenn Gould has the country seen a Bach pianist like Angela Hewitt. She grew up in a musical family in Ottawa and has been playing the piano since the age of three. Hewitt won her first Governor General's Award in 2003 and remains a household name in the realm of Canadian classical music. A small selection of her vast discography would include Beethoven, Chopin, Couperin, Rameau along with concertos by Schumann and Mozart. She is currently working on The Bach Odyssey, a series of twelve recitals performed over four years from 2016, which she'll complete in 2020. Nicknamed "Captain Canada," Peter Herrndorf is receiving a Special Lifetime Artistic Achievement Award for his lifelong contribution to the nation's mainstream arts and media. He served as vice president of English services at CBC from 1979 - 1983, and oversaw the development of landmark television programming such as The Fifth Estate, The National and The Journal. He went on to become the publisher of Toronto Life magazine and the CEO of TV Ontario. From 1999 to his retirement in June 2018, Herrndorf served as CEO and president of The National Arts Center, and was one of the forces behind the creation of the Governor General's Performing Arts Awards.